Home » Occupational Therapy » What is it like to struggle with executive functioning? What is it like to struggle with executive functioning? I’ve been reading more on executive functioning skills with children and came across this excellent article from Understood (a nonprofit that supports parents of children with attention and learning struggles). This article focuses on describing the experience of children who struggle with executive functioning skills in daily life. Do you have a child or student who struggles with one of these areas? I challenge parents (and professionals working with children) to try at least a few of the simulations to have at least a glimpse of what it might be like to live with the experience of a learning disability. Dr. Thomas E Brown’s A New Understanding of Attention Deficit Hyperactivity Disorder– with a nice flowchart showing different components of attention disorders and how it relates to executive functioning skills. 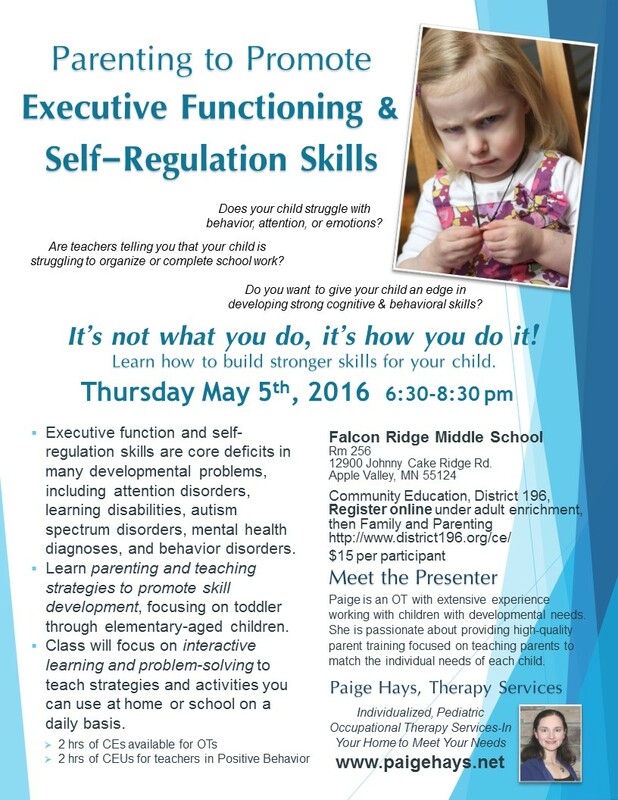 Upcoming presentation in Apple Valley, MN on Parenting to Promote Executive Functioning and Self-Regulation Skills- May 5th!